Camp Quality is delighted to announce that our dear friend and supporter Martyn Sawyer will be once again helping Camp Quality to raise vital funds through the Racing the Planet Series – The Ecuador Race which will take place in July 2015. Since he started back in 2006, with his efforts and everyone’s contributions Martyn has helped to raise a substantial amount of funds for Camp Quality. We have been able to touch and change the lives of many of these sick children with the kind and generous support from people like him and you, our supporters. You have all helped Camp Quality bring much joy and relief to children living with this disease by allowing them to escape the hospital environment and enjoy themselves in an outdoor setting where they can forget about their illness. Once again, Martyn’s main driving force behind this competition will be to raise as much funds as possible for the children of Camp Quality. 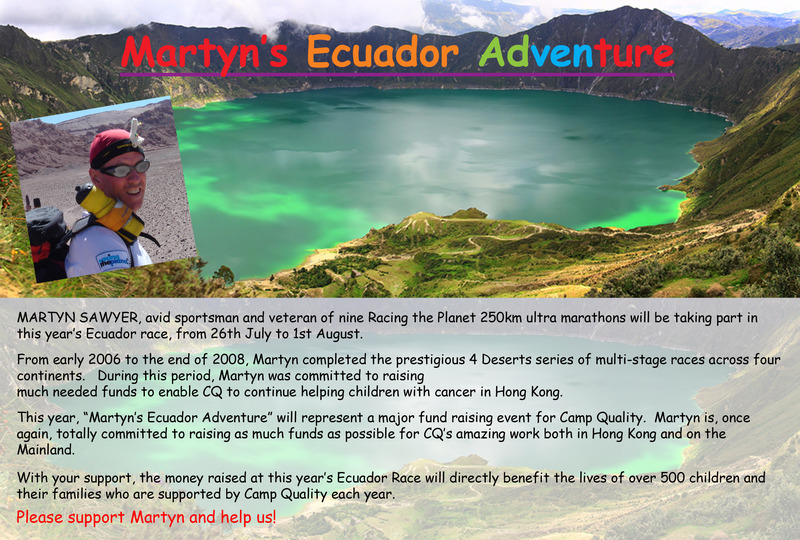 Please do support Martyn and help us!! 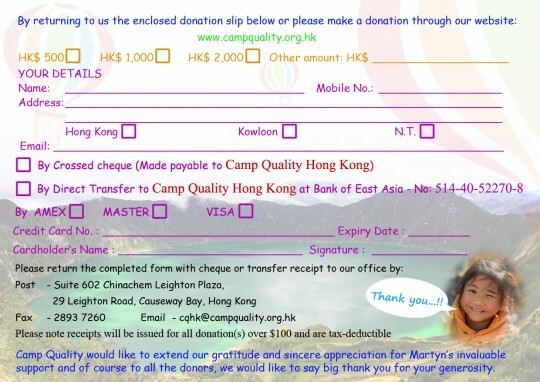 On behalf of everyone at Camp Quality Hong Kong, and all of the children we serve, thank you for your generous support, which contributes directly to our charity’s success!